If you’ve suffered a strain or injury we’ve got a wide range of therapies at our Southampton clinic, from physiotherapy and remedial massage through to acupuncture and the revolutionary Apostherapy™ system. Many of our treatments are eligible for health insurance claims. Therapeutics provides a range of facilities and treatments to help you stay fit and well. Use our gym, with the help of a personal trainer if you like, or join one of our pilates and yoga classes for the style of exercise which best suits your life. 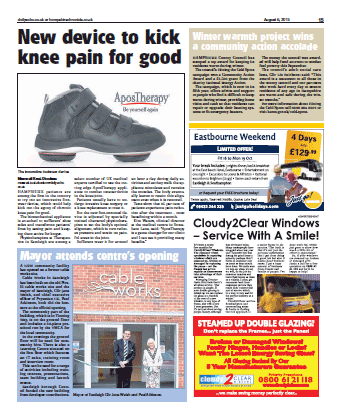 Hear Therapeutics patient Callum Giles telling BBC Radio Solent how Apostherapy® treatment relieved his pain. AposTherapy® practitioner Kim talks about how this new therapy is helping patients with knee and back pain. In this newsletter we look at the benefits of massage therapy. We also share a Jo Smith’s osteoarthritis story and look at the ways in which osteoarthritis can be treated….